Femto Camera: A Trillion Frames per SECOND!!!! AMAZING! Thas camera takes photos at 1 Trillion Frames per second... That is the speed of LIGHT! That means that this camera can take photos of lght as it moves through objects. 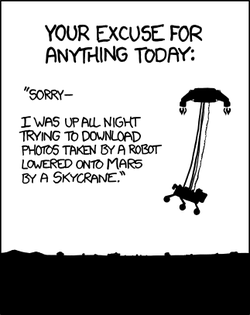 This is a link to the Nasa Homepage for Curiosity, the most recent MARS ROVER!! Check out Raw Images from the Martian Surface, updates on the rover's progress on Mars, and so much more!!! The search for exoplanets, or worlds orbiting other stars, is evolving so fast that discoveries that seemed exotic just a few months ago have become commonplace. Multiple-planet solar systems? Astronomers expected to find just a handful; now we know of more than 200. Planets orbiting double or even triple stars? It was big news when just one was announced back in September; we've already got several more examples in hand. In short, the unexpected is something planet hunters have learned to expect — and in most cases, these surprises have tended to expand the possibilities for finding worlds where life might thrive. Or read about it BELOW ! Two Canadian high school students have successfully launched a Lego man almost 80,000 feet above sea level--high enough to capture video of the plastic toy hovering above the curvature of the Earth. 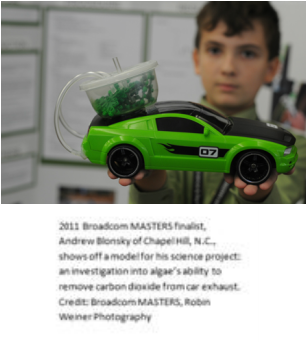 Now the results of their experiment have gone viral, racking up more than 600,000 views on YouTube in just two daysand inspiring the young engineers to make their small astronaut his own Facebook page--Lego Man in Space. After the balloon was constructed, the two waited until weather conditions would ensure that the Lego man would land in Canada and not somewhere in the U.S. because they didn't want to take their chances with U.S. Homeland Security, the Star reports. WASHINGTON — A newly discovered planet is eerily similar to Earth and is sitting outside our solar system in what seems to be the ideal place for life, except for one hitch. It's a bit too big. The planet is smack in the middle of what astronomers call the Goldilocks zone, that hard to find place that's not too hot, not too cold, where water, which is essential for life, doesn't freeze or boil. And it has a shopping mall-like surface temperature of near 72 degrees, scientists say. A robotic machine, controlled by an Android smartphone, claims it can solve a Rubik's cube faster than any human. Check out the video above for a proof of concept. It's pretty amazing to see. 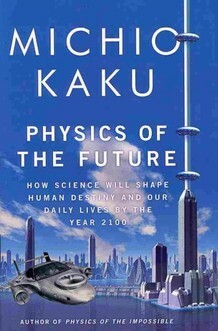 _"Physics of The Future": How We'll Live in 2100? Imagine being able to access the Internet through the contact lenses on your eyeballs. Blink, and you'd be online. Meet someone, and you'd have the ability to immediately search their identity. And if your friend happens to be speaking a different language, an instantaneous translation could appear directly in front of you. That might sound farfetched, but it's something that might very well exist in 30 years or less, says theoretical physicist Michio Kaku. (For Extra Credit write a summary of one of a topic you listened to... You will have to wait a few hours for the site to publish the podcast each Friday). Have you ever wondered why zombies stagger around with their arms stretched out, clamoring through cemeteries in search of victims? And how come they refuse to talk, just moaning from time to time. And why are they so hungry (mainly for human brains!). The US space shuttle Endeavour has launched on its final mission. Its thunderous rise into a bright morning sky over the Kennedy Space Center in Florida was watched by hundreds of thousands of spectators. Among them was Endeavour commander Mark Kelly's wife, Gabrielle Giffords, the Arizona politician shot in the head by a gunman in January. Doctors were satisfied enough with her recovery to allow her to travel to Kennedy to see her husband's departure. "This mission represents the power of teamwork, commitment and exploration," the commander said in a radio call to launch controllers moments before lift-off. "It is in the DNA of our great country to reach for the stars and explore. We must not stop." Endeavour cleared the pad just after 0856 local time (1256 GMT; 1356 BST). It is now on a path to rendezvous with the International Space Station (ISS) on Wednesday. The ship will deliver a $2bn particle physics experiment, known as the Alpha Magnetic Spectrometer (AMS), and a tray of critical spare parts. 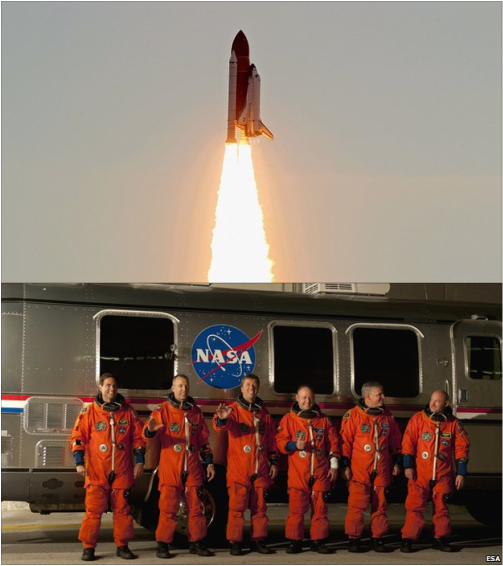 On Endeavour's return, the only active ship left in the US space agency's (Nasa) shuttle fleet will be Atlantis. It should undertake its final mission sometime in in July. "Today's final launch of Endeavour is a testament to American ingenuity and leadership in human spaceflight," Nasa Administrator Charles Bolden said in a statement. "As we look toward a bright future with the International Space Station as our anchor and new destinations in deep space on the horizon, we salute the astronauts and ground crews who have ensured the orbiter's successful missions. "The presence of Congresswoman Gabrielle Giffords at the launch inspired us all, just as America's space programme has done for the past 50 years." On completion of the 30-year shuttle programme, America will use Russian Soyuz capsules to fly its astronauts to the ISS. A number of US national commercial carriers are expected to enter into service around the middle of the decade. Nasa will then buy seats in these astronaut "taxis". The arrangement will represent a major change in the way the agency does business. No longer will it own the vehicles it uses to go to low-Earth orbit. This servicing plan should free up resources for Nasa to build an astronaut Space Launch System capable of travelling beyond the station, to the Moon, asteroids and to Mars. Endeavour was built to replace the Challenger ship which was lost, along with her crew of seven, in a catastrophic accident in 1986. This final flight is the vessel's 25th overall, having already clocked a cumulative distance in space of 166 million km - an expanse just greater than that which divides the Earth and the Sun. It looks like a giant potato in space. And yet, the information in this model is the sharpest view we have of how gravity varies across the Earth. The globe has been released by the team working on Europe's Goce satellite. It is a highly exaggerated rendering, but it neatly illustrates how the tug we feel from the mass of rock under our feet is not the same in every location. Gravity is strongest in yellow areas; it is weakest in blue ones. Technically speaking, the model at the top of this page is what researchers refer to as a geoid. It is not the easiest of concepts to grasp, but essentially it describes the "level" surface on an idealised world. Look at the potato and its slopes. Put simply, the surface which traces the lumps and bumps is where the pull of gravity is the same. Described another way, if you were to place a ball anywhere on this potato, it would not roll because, from the ball's perspective, there is no "up" or "down" on the undulating surface. It is the shape the oceans would adopt if there were no winds, no currents and no tides. The differences have been magnified nearly 10,000 times to show up as they do in the new model. Even so, a boat off the coast of Europe (bright yellow) can sit 180m "higher" than a boat in the middle of the Indian Ocean (deep blue) and still be on the same level plane. This is the trick gravity plays on Earth because the space rock on which we live is not a perfect sphere and its interior mass is not evenly distributed. On March 19th, a full Moon of rare size and beauty will rise in the east at sunset. It's a super "perigee moon"--the biggest in almost 20 years. "The last full Moon so big and close to Earth occurred in March of 1993," says Geoff Chester of the US Naval Observatory in Washington DC. "I'd say it's worth a look." On March 17, 2011 (March 18, 2011, UTC), MESSENGER became the first spacecraft ever to enter Mercury's orbit. The probe will continue to orbit the planet once every 12 hours for the duration of its primary mission. The first few days after orbit insertion will be focused on ensuring that the spacecraft systems are all working well in the harsh thermal environment of orbit; this interval is known as the orbital commissioning phase. On March 24, 2011, the instruments will be turned on and checked out, and on April 4, 2011, the science phase of the mission will begin and the first orbital science data from Mercury will be returned. For additional information, read Mercury Orbit Insertion and Station Keeping.